Pan’s Labyrinth is both a metaphorical and literal look at life under Francisco Franco’s rule in Spain during the 1940s. The film is centered around a young girl named Ofelia (Ivana Baquero) who discovers that she is the princess of an imaginary kingdom that lies just outside of her reality. Ofelia’s memory of her time in this kingdom was erased, but when she stumbles upon some labyrinthine remains, she begins to remember her otherworldly past. In contrast with this revelation, the audience comes to discover Ofelia’s predicament in the real world. She is the stepdaughter of the evil Captain Vidal (Sergi Lopéz), and her mother, Carmen (Ariadna Gil), is due to have a baby soon. But Vidal doesn’t care if Carmen dies, as the only thing he wants in life is the son she is bringing him. To put it lightly, Ofelia has quite a miserable childhood until she discovers the magical labyrinth. The film expresses a rich mythology. Ofelia sees her world through a child’s point of view, meaning that much of what the audience sees is shrouded in uncorrupted innocence. For instance, the first creature Ofelia meets when she enters the labyrinth is Pan. Pan is a faun (half-man, half-goat), which in popular Roman mythology is an inhabitant of the woods. Going further than this, a particular satyr (considered a cousin of the faun) by the name of Pan was regarded by the Romans as the ruler of the wild. This is why, in relation to the film’s title, Pan rules the underworld Ofelia aspires to belong to. The labyrinth is contained in natural rather than constructed settings. One of the more interesting aspects of Pan’s Labyrinth is the sense of playfulness it injects in light of its dark themes. The story is a bit out there, and del Toro realizes this, but he does a masterful job of toying with two distinctly different cinematic realities. The overall mood of the film is rather grim and this is reflected in its color scheme. Spain is construed in bright light, while the labyrinth is defined by far darker hues. It’s a bit flipped, as Ofelia’s perilous present is shrouded in light whereas her much-needed escape is shrouded in shadows. Del Toro wanted to imbue his vision of Spain with multi-hued contrasts, and he succeeds in large part with this. 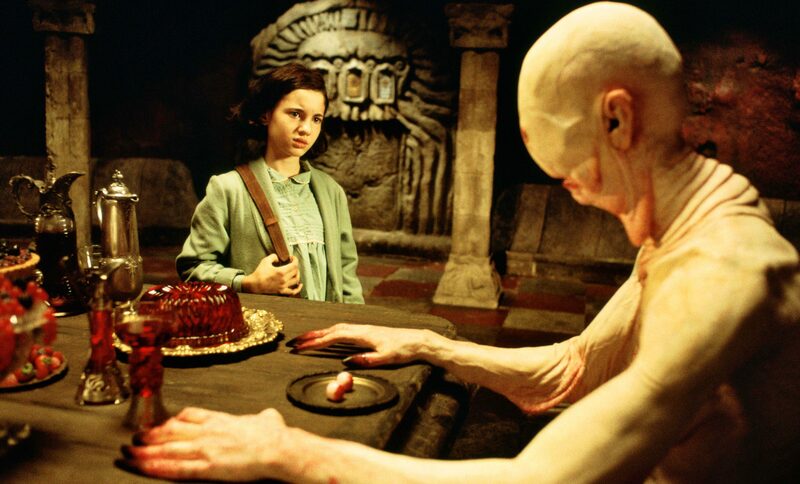 His efforts paid off in the end, as Pan’s Labyrinth went on to win three Oscars in 2007. Pacific Rim is bombastic, to say the least. Paying homage to old Japanese Kaiju films, the success of this film hinges upon its action rather than its story elements. In the future, enormous alien monsters called Kaiju are brought to Earth by a portal created in the deepest reaches of the Pacific Ocean (hence the film’s title) and begin to wage war on humans. It is therefore up to the efforts of the Jaegers, giant fighting robots manned by human pilots, to stop their destruction. The fight sequences between the Kaiju and the Jaegers are fantastic. Besides these mighty displays of strength, however, the audience comes to learn about the humans behind the suits. This is when Pacific Rim truly succeeds as a modern-day blockbuster film. Raleigh Becket (Charlie Hunnam) is still suffering from the post traumatic stress disorder of losing his brother in a recent battle. He decides to leave the Jaeger program behind and work on an Arctic oil rig. His chance to redeem himself arrives when he’s recruited by Stacker Pentecost (Idris Elba) to fight the Kaiju with another battered fighter by the name of Mako Mori (Rinko Kikuchi). Becket and Mori team up in an extravagant and well-choreographed series of battles to defeat the last of the Kaiju. The lengthy brawls in the film play like a ballet routine at times. While the action may be slowed down at critical moments, it generally moves at a fast clip and del Toro effectively doles out enough Jaeger-on-Kaiju thrills to keep any seasoned action-goer pleased. At the same time, however, the characters in Pacific Rim are nuanced and relatable. As a director, del Toro once again shines in providing a rich color scheme. This film is resplendent in vivid blues, striking red and fiery oranges. 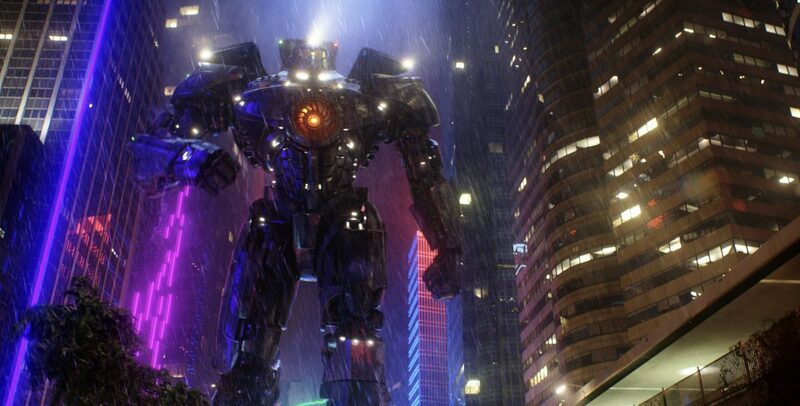 While the story is a bit formulaic (especially toward the end), Pacific Rim succeeds by providing fun popcorn fare. In the end, Pan’s Labyrinth is an overall better film than Pacific Rim. It’s a subtle blend of melodrama and political allegory and in addition to its effectively rendered characters and metaphorical imagery, the film also succeeds as a piece of realistic yet fantastical filmmaking. While Pacific Rim focuses solely on action, Pan’s Labyrinth works on character motivations and world-building. In turn, the environment of the film is complex and rivetingly visualized. The audience is drawn into Pan’s Labyrinth because, like its child protagonist, we all long for escape.